This is something that instantly makes my heart jump a beat. I was visiting San Francisco in April this year for work and while I was there, one of my key action items [other than work ;)] were that I had to explore the local cuisine. So me and three of my friends – Manjunath, Vandana and Bhavna went about exploring Pier 39. If you’re in SFO, this is one place you *have* to visit. 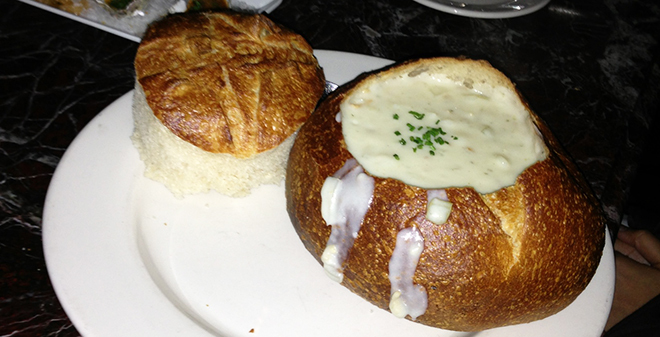 On Pier 39, we found the Fisherman’s Wharf where we came across this beautiful bakery called Bistro Boudin. We’d done our homework before coming to this place and as soon as we were there – we knew exactly what we wanted to eat.